The compression latch has two optical opening indicators. 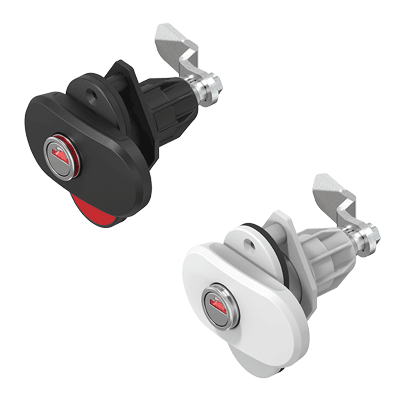 These consist of the indicator of the clip-in cylinder and the second indicator for the position of the handle. In case the opening indicator on the sleev and the clip-in cylinder is visible, the compression latch is unlocked. The same is true for the opening indicator between handle and housing. In case the opening indicator is visible, the compression latch is compressed. The Basic versions are the new, cost-optimized variants of the compression latch, which do without the optic opening indicators. In addition to the basic variant in ECO black, a UV-stabilized variant in white is also available. and/or supplementary measures of fastening required.